SAN FRANCISCO, CA--(Marketwired - Dec 9, 2014) - Today Moovit, the world's leading public transit app, found in a survey of more than 13,000 global users, people in major U.S. cities wait approximately 40 minutes per day for public transit, costing them 150 hours per year. This accounts for 31 percent of their commute time. Los Angeles topped the list with the worst waiting time in the world, with Boston taking third place. These long waits are a major factor in causing dissatisfaction with public transit. In the five major cities surveyed in the U.S., 31 percent of the people surveyed are dissatisfied with public transportation. The primary frustration across all U.S. cities surveyed is a lack of information -- not knowing when or if the bus or train is going to arrive. This was considered more important than actual wait times, safety, overcrowding, and unfamiliar routes. This frustration can be significantly reduced by providing people with better transit data. "Based on these findings, it is clear that people would use public transit more often if they knew when their next train or bus is coming," says Nir Erez, CEO and co-founder of Moovit. "Technology can solve this challenge. Real-time location and estimated arrival of people's buses and/or trains is now being made available. With more than 400 global cities and 10 million downloads under our belt, Moovit is doing its part to get the word out. We are rapidly expanding to cities across the globe." 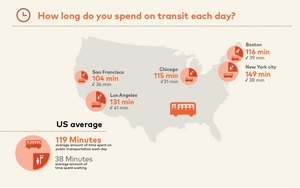 In the U.S., people spend an average of 105 minutes per day on public transit. New York City topped the list in terms of longest commute time in the world at 149 minutes. Globally, Sao Paulo and Toronto came in next with 138 minute average commutes. Los Angeles and Rio de Janeiro topped the list in terms of longest wait times at 41 minutes, followed by Boston at 39 minutes. Commuters in Barcelona and Milan spend the shortest amount of time on public transit at 63 and 74 minutes per day, as well as waiting for trains and busses with wait times of 18 and 19 minutes, respectively. Moovit is transforming the way we use public transportation. Launched in March 2012, the app currently has more than 10 million downloads worldwide. By combining information from public transport operators and authorities with live data collected in real time from the user community, Moovit offers travelers an accurate picture of the fastest, most convenient routes. Moovit's corporate headquarters are located in Ness Ziona, Israel, with an international office in San Francisco. In Dec. 2013, Moovit raised $28 million in a round led by Sequoia Capital Venture Capital Funds, in addition to the $3.5 million it raised in a previous round from Gemini Israel Ventures and the BRM Group.